You’ve heard us say that HD signals must be compressed in order to be transmitted, because otherwise a huge satellite could only carry a tiny number of channels. With compression comes some sort of loss, especially when you are talking about squeezing 90% or more of the space out of an image. Compression artifacts come from many sources. Bitstarving generally reduces the quality of an image while letting providers still call it HD. There are other artifacts, too: macroblocking puts blocky patches in large smooth areas,, while pixelation happens when there is too much movement to show a truly high-def image. Mosquito noise happens when too much compression comes in and shows little bits of color where they shouldn’t be. All of these techniques are destructive. They hurt the pristine quality of the image. If they’re used sparingly you don’t even know they are there. 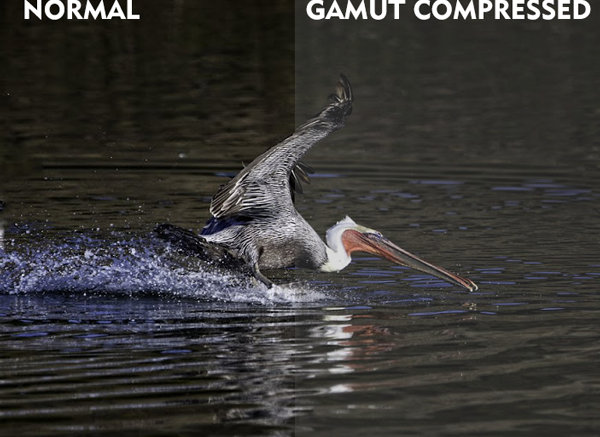 Another way you can get more picture into less space is gamut compression. This sounds like a highly technical term… it’s easier to show it than describe it. A perfect image looks like the one at the left. Dark black areas mix with white ones to give you the image of a bright, crisp day. The image on the right is gamut compressed. The black isn’t as black, the white isn’t as white. It looks like it was taken on a cloudy day, with a little bit of mist in the air. The thing about gamut compression is that you don’t really notice it. If you saw the right side of the picture you wouldn’t think anything was missing. It’s only after you see the left side that you realize that it could look so much better. Pretty much every provider of cable, satellite, streaming, or antenna TV uses gamut compression. Even “pristine” Blu-ray discs can use it. It’s a lot less distracting than other techniques and it’s surprisingly effective. Believe it or not, the image on the left uses 4 times more space than the image on the right. That’s one of the funny things about digital technology … it takes twice as much space to count to 128 as it takes to count to 127. Gamut compression uses that weird fact to give you a picture that’s “almost as good” for a lot less space. Gamut compression is the opposite of “high dynamic range.” High Dynamic Range or HDR uses the signal’s complete range from black to white, and specially equipped TVs can show blacks that are much blacker and whites that are much whiter than normal HD or 4K TVs. With HDR content you can’t compress the gamut, that’s the opposite of what you’re trying to do. Although studies have shown that customers don’t yet care about HDR content, it’s slowly entering the public’s consciousness and when customers start demanding more and more HDR, that will be the end of gamut compression altogether. Image courtesy of Barry Blanchard. When should you use a Broadband DECA?